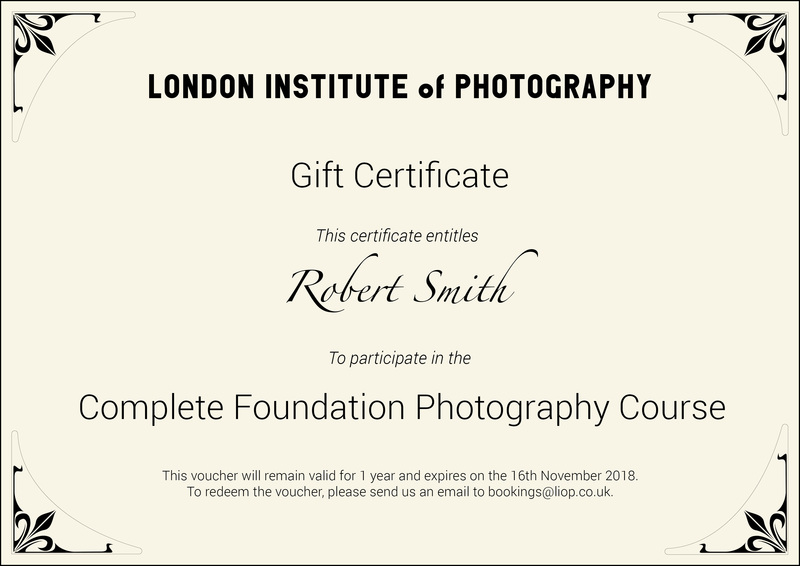 All our photography courses are available as Open Date Gift Vouchers, the perfect idea to share your love for photography. It’s quick and simple, just select the course from the menu below, checkout and receive a personalised Gift Certificate by email or post. If you require further information or need help with your booking please do not hesitate to call us on +44 (0)20 8533 5362 or send an email to bookings@liop.co.uk. Shortly after payment is received we will email you a personalise gift voucher (a file that you can print yourself), stating the name of the student as well as the course title. To view a sample please click HERE. If you would like to receive a Printed Gift Voucher please contact us by email after the purchase and we will post the printed certificate free of charge. All our vouchers are Open Date Gift Vouchers and valid for 12 months from the date of purchase, giving the voucher holder plenty of time to select a suitable course date. We will accept the voucher as full payment for the course. We will take care of the rest and send a booking confirmation email to the voucher holder.